Having real SSL certificates to be used as mail domain for Postfix and dovecot in ISPConfig, is quite a good discussed topic at the moment. Today I had quite a interesting thought how this could be done. The solution I have in mind, will work without any doubt, but it has it’s downside. According to a description in one of my older posts, ispconfig 3.1 + Lets Encrypt + Postfix / Dovecot + PureFTPD in english we can take advantage of the fact, that ISPConfig is just setting symlinks on certificates in the web directory and then just fires up a cron to renew your certificates. In case your configuration looks like I did describe it in the blog post mentioned above, then it will be quite a easy thing. But first let me describe my theories. What happens in the background? What ISPConig does, when you setup a new site, is to request a SSL certificate via the Let’s Encrypt bot. In case your domain A and AAAA records are all in place, the certificate will be issued, and you can access this site from https. 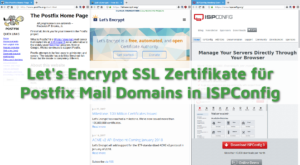 ISPConfig check in the background whether the certificate has been issued by Let’s Encrypt or not and in case all things went fine, ISPConfig places a symbolic link from /etc/letsencrypt/live/your-domain.tld/cert… to /var/www/your-domain.tld/ssl/cert…, changes the configuration in the Apache vhost configuration and restarts / reloads your web server. I have taken advantage of this method to have the ISPConfig Interface, Postfix, Dovecot and PureFTPD deliver a valid SSL certificate. To get this done, you just need to create a site with your hostname in ISPConfig to get a Let’s Encrypt SSL certificate and then you can use that one and ISPConfig will take care of it’s renewal etc. The fact that one can also create alias domains in ISPConfig, will lead you to the fact that ISPConfig will then request for a certificate for both domains. In case all DNS records are correct, you will get a valid certificate for both domains. Now, does that ring a bell? No? Well, then continue reading. and your client can enter his mail.client-a.domain in his Outlook, Thunderbird, Android or any other client, and will not get a warning message anymore. The problem I see with this, is almost jumping right into your face. Exactly. In case you have like 20 clients, and you have setup them all with the method above, that one certificate will deliver all of these domain names. The problem with it is, that all clients can see whom else you are hosting on your server. But clients can also see what other clients are there. And all this is, IMHO a huge privacy issue. I also think, that clients should not just know, or have a list of whom else you are hosting on your machines. Myself, I would not do it. How is it with you? Would your clients allow that? Let me know in the comments, via Twitter or Facebook what you think about it.